One of our expert gives you the things you can not fail to do during your next visit to the "white capital".Be amazed by its architecture, history, culture and traditions! colonial times and the Porfiriato.You will be amazed! 2. Take a ride Calandria (sort of horse-drawn carriage) through the main streets of the city center; you've never met from another angle several buildings, monuments and squares of the "white capital". 3.Conoce Canton Palace, spectacular building in neoclassical style, today, houses the Regional Museum with its fantastic collection of pieces from the Mayan culture. 4. On the Paseo Montejo, admire the imposing Monument to the Fatherland. Take a look at each of his prints that evoke different moments in the history of Mexico and the Yucatan in particular. 5. In the center of the city, admiring the facade of the famous Palace and Casa de Montejo, built under the conqueror of the region, Francisco de Montejo, the second half of the sixteenth century. Today, this building houses an elegant museum sponsored by Fomento Cultural Banamex. 6. Visit the Cathedral of San Ildefonso that recently just released a spectacular lighting at dusk allows viewers to admire even better its beautiful architectural details. 7. 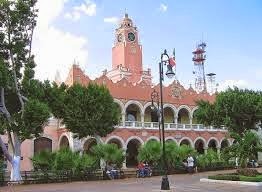 Eat a marquise cheese ball or peanut butter on one of the squares and public parks that are located in the downtown area of Merida. 8. Visit the Macay Museum, located next to the Cathedral.Admire its magnificent collections of art ranging from Mayan artifacts to complex expressions such as graphic artists, paintings, watercolors, sculpture and digital art! 9. Taste the best Yucatecan cuisine (panuchos salbutes, lime soup, roasted suckling pig, among other delicious dishes) at the various restaurants that are located in the first frame of the "white" Mérida. We recommend you visit Los Almendros, traditional property located on the outskirts of La Mejorada Park. 10. Get on Turibús, with stops at strategic points in the city, meet different corners of it while you take the funniest photos in the company of your partner, friends or family.Sure have fun! 11. Weekends part of the interesting legends tours organized in the city center. With years and experience, this original "dramatization of stories" every day becomes more fans or followers. 12. If you like history, join in guided every day and several times start from the Central Plaza and cathedral views. Sign up in advance at the tourist attention modules are located under the arches that decorate the building of City Hall. 13. Choose hats and guayabera shirts, clothing typical of the state of Yucatan, in any of the stores that are located in the downtown area and at various points of the Paseo Montejo. Looks like a whole meridense with these lightweight textile fibers as imposed fashion around the world! 14. Many people say that to get to know each region is necessary to know what drink is made and drunk there. In Merida, you can not not take a shot of the famous Xtabentún offered in various establecimeintos the city center and various shopping malls. 15. If you like sports, Merida favorite is baseball. Do not miss any of the matches of the Yucatan Lions, the team of the city, in recent years, was champion of the Mexican League. For fans of soccer, table playing here (in the Division of Ascent) are the deer, with its elegant uniform light blue tones.Support them!